While the Blue Mosque may be more spectacular, the Green Mosque may in its way be more inviting. 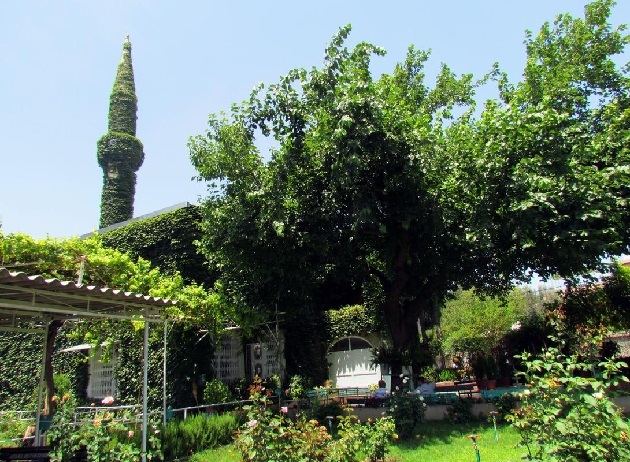 It is probably the greenest construction in Turkey, with ivy enveloping its walls and a kind of botanical garden full of colorful flowers providing the faithful with a naturally cool place to pray in the midst of the summer heat. Unlike many other minarets which soar into the sky like sleek stone towers, the minaret of Yesil Mosque is completely covered with leaves that completely hide the construction from view. Rather than looking like a building, the mosque looks almost like leafy garden somehow shaped like a mosque. 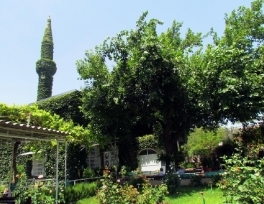 Known as one of the most beautiful places in Adana, Yesil Mosque charms many visitors. Beyond providing an unusual beauty and a cool place to pray, the ivy serves another purpose: It protects the building. The Yesil Mosque Protection and Sustenance Association is in charge of maintaining the condition of the building. And the integrity of the construction has been maintained without any restoration since 1965, when the minaret was constructed and the previous wooden building was converted into a concrete one.